hey baked, they iced, they captured 3,000 years of history in a perfectly risen sponge. 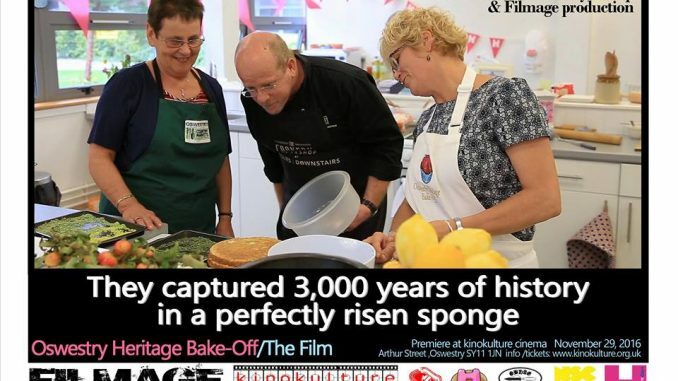 Now you can see how a madcap 24 hours of filming unfolded as kinokulture hosts the premiere of the much anticipated ‘Oswestry Heritage Bake-Off: The Film’. Enjoy all the thrills and spills of the contest as our three plucky finalists – Alex, Louise and Pip – emerge from a cloud of icing sugar with their yummy tributes to Oswestry borderland heritage. Against all the odds, including over-sized aprons and unfamiliar ovens, our bold baker-teers lock whisks in the kitchens of North Shropshire College in a battle of literally monumental proportions. In the heat of the bake-off, there is sweat, there are tears (of laughter), but not one hint of a soggy bottom. Plenty of time for that when the finalists face the tension of the judging tent against the magnificent backdrop of Oswestry Castle. Move over Mr Kipling and Dr Oetker; these showstoppers are crafted with an extra special message – love for local heritage. And move over Great British Bake Off’s Mary, Paul, Mel and Sue; Oswestry has its own bake-off stars in the shape of Margaret Edwards, Yossi Gliksman, Terry Cripps and Dru Cripps. This is the Christmas ‘feel good’ film to put you in the mood for the festive season – or at least a stroll around an historical relic followed by cake in a local tea room. A celebration of the area’s rich history, The Oswestry Heritage Bake-Off was produced and filmed by the HOOOH Community Group and Filmage as part of Oswestry Heritage Open Days 2016. The project has been generously supported by its official partners: the award-winning kinokulture cinema, North Shropshire College, Oswestry Country Market, and Oswestry & Border History & Archaeology Group.